This user likes to block. This user prefers one-handed long blades. This user really hates Cliff Racers more than anything in Vvardenfell. This user is very fascinated by the Mundus' night sky (solar system / universe / cosmos etc.) seen from the Nirn. This Redguard couldn't care less if you are a man, mer or a beast so keep racism (e.g. Betto Plotius and Julitta Plotius, ) and slavery out of Tamriel! Even though it is highly controversial (e.g. , ) and still studied  issue, this Redguard wishes he could marry a beautiful Dunmer lady ;). This user is knowledgeable about Oblivion Official Add-ons. This user does NOT acknowledge The Elder Scrolls Online to be a part of the TES series in any form or shape. The Elder Scrolls is, and should remain, a single player franchise! Stop right there criminal scum, you violated the law! I'm here to protect and serve, and I react pretty quickly... . This user is from Poland. This user has been on UESPWiki for 7 years, 6 months, and 11 days. Today is Fredas, 12th of Rain's Hand. My name is Adrian, I'm 26 years old Pole living in the United States Australia. To be truthful, I've discovered this site not long time ago but it provided me with great information on so many things (mainly lore oriented). In real life I'm a Caucasian male, college student graduate and I love The Elder Scrolls series. Seriously, once I bought TES III: Morrowind the day it came out (05.05.2002! ), I became addicted to the whole TES world. Morrowind (with expansions) is easily my favorite of the series. Oblivion didn't do it for me (even though I bought it when it came out)... Skyrim was better than Oblivion but nowhere near Morrowind. Mainly I tend to spend my time at work and University, but when I have some of it for myself I divide it between my friends, my girlfriend wife, and the TES world. I am very happy that they've continued to allow single-player play in TES series, as if I wanted to play MMO, I would interact with real people, not play a computer game!.. I do not consider The Elder Scrolls Online, in any form or shape, a part of the TES franchise, therefore I don't believe that the content from this game should be used at all for the lore purposes. I, as many orthodox and die-hard TES fans, feel betrayed by Bethesda. 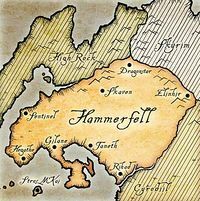 In the past (for example in 2011), Todd Howard stated that the TES genre won't ever be developed into an MMO, he lied..
Hammerfell, the current home of the Redguards. 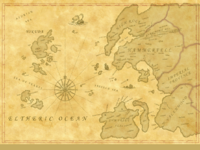 A map showing Yokuda, the ancient home of the Redguards.